So what is open space? The U.S. Department of Energy Smart Communities Network defines it as "An area of natural landscape essentially undeveloped, such as ridges, streams, natural shorelines, scenic buffer areas, and agricultural lands." 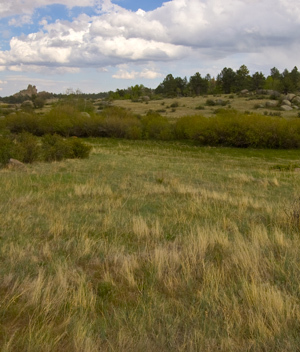 To help inform efforts to maintain open spaces in Wyoming, we make data and information regarding open space -- including articles, books, videos, digital data, terminology, and references -- accessible through regular publications and this web site. We also assess regional examples of land use laws, regulations, ordinances, and visioning exercises to better understand Wyoming's baseline for open space and land use issues and to determine where we should concentrate our efforts in the future. Another task is the implementation of various tools for analysis such as geographic information systems, and software to aid communities in planning efforts.